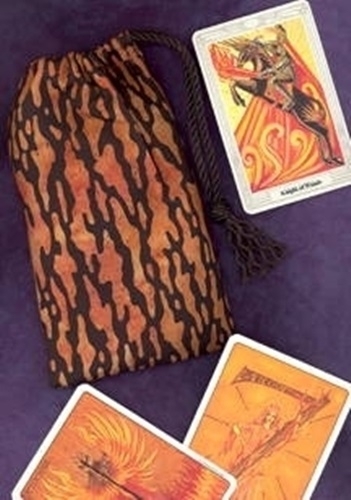 Representing the element of fire, this tarot bag is covered with orange flames against an ebony black background. 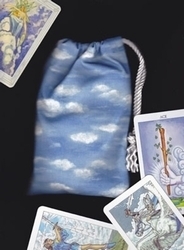 Holding the bag in front of you is like looking into a soot darkened fireplace. It is easy to become mesmerized by the diverse shapes and colors provided by the flames. Fire Symbolism: Fire represents passion and strength of will. The animating force of the Universe is represented by fire, called the 'spark of life.' In tarot, the suit of Wands (aka Batons, Staffs) is the suit that represents the force of fire and all that entails. 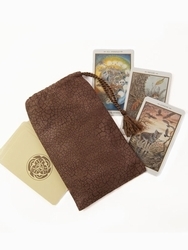 In astrology, Aries, Leo, and Sagittarius are fire signs. 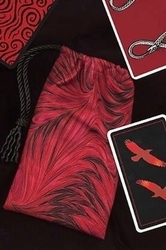 Deck Suggestions: Most tarot decks have cards that use this color scheme, especially in the suit of wands with the warm tones in the orange to red range. 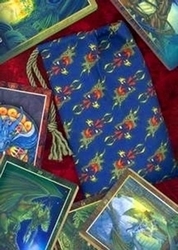 Pictured with the bag are cards from the Gill Tarot (below bag) and the Thoth Tarot (right of bag).